Politicians realize the importance of creating presence on the internet to expand and maintain their support base. 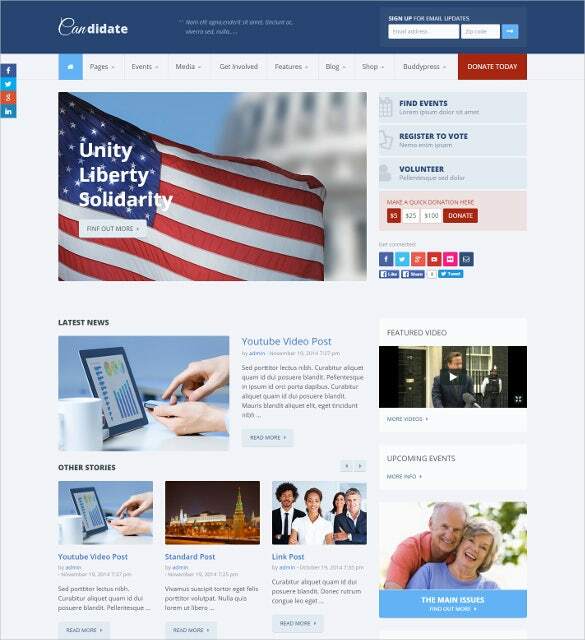 With top leaders such as Obama taking to Twitter to personally interact with the public, the worth of using the internet to their advantage is quite apparent.These free and premium themes allow the creation of great political websites to properly ‘sell’ one’s image to the masses.You may also check Political PSD Themes. The worth of using the internet to increase as well as maintain the support base is essential for politicians. 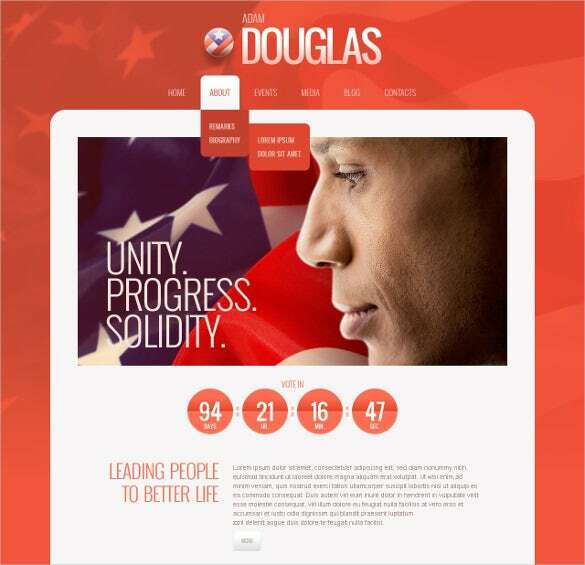 So the Beautiful Political Candidate WordPress Theme can be used to develop exclusive designs for the political websites. 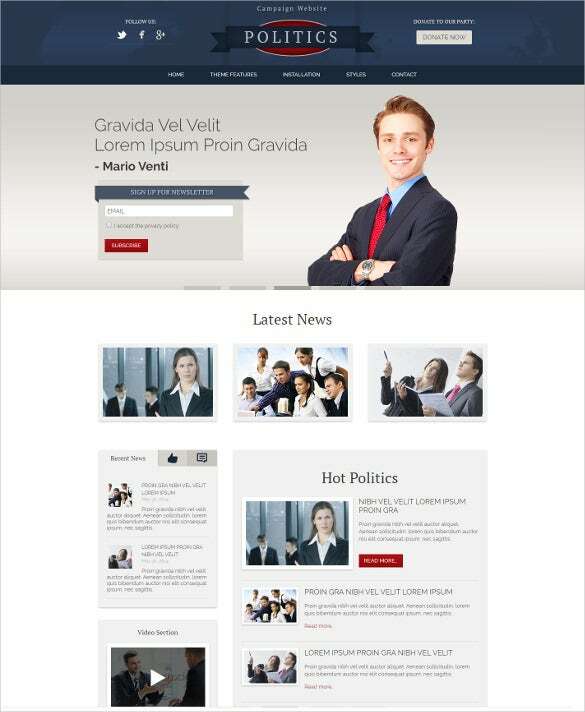 The menu section is fully widgetized and has a complete responsive layout. 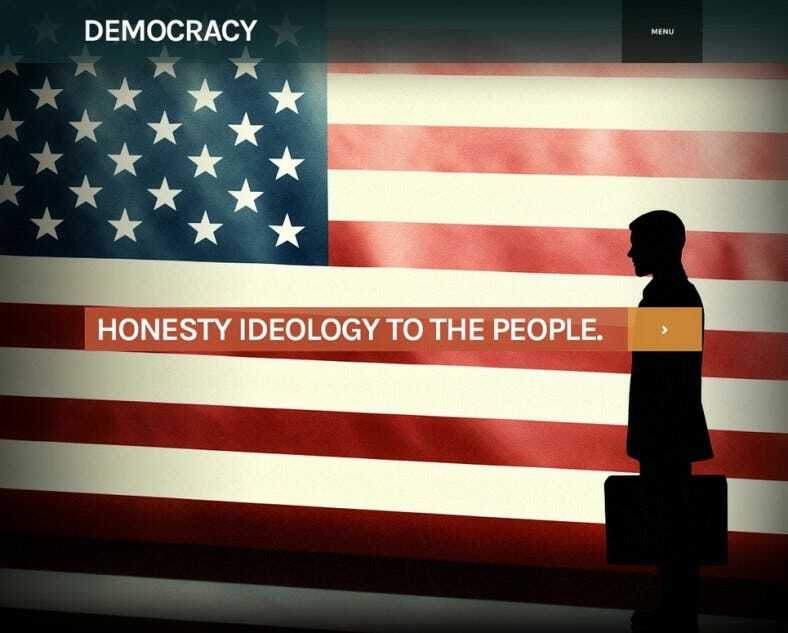 Catchy illustrations with neat typography help to propagate the agenda of the party. 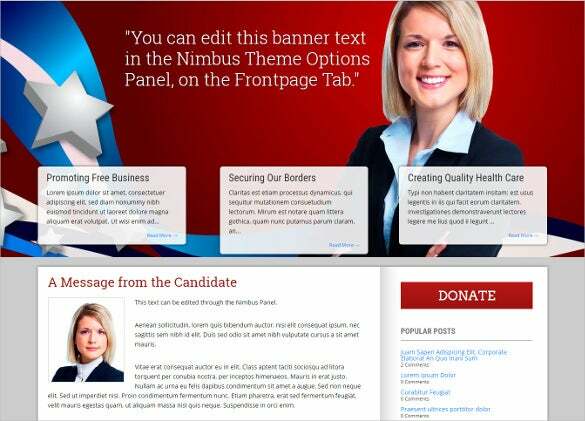 A political WordPress theme is your best bet when you have to design and build a quick-fire and effective political campaign website for a political candidate hoping to win big. 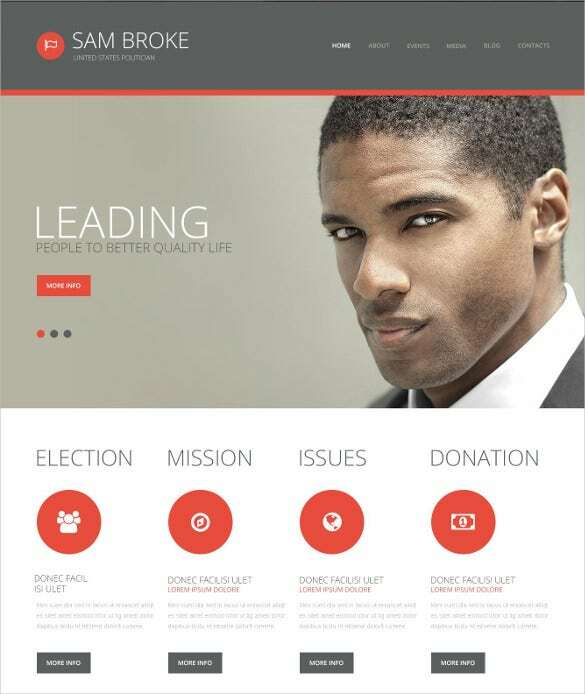 The fully-responsive theme is wired with the best features including: retina ready images, mail chip integration, bootstrap 3 framework, plenty of HTML codes, advanced CSS coding, wide layout etc. Many diplomats and politicians are making it a point to interact personally. 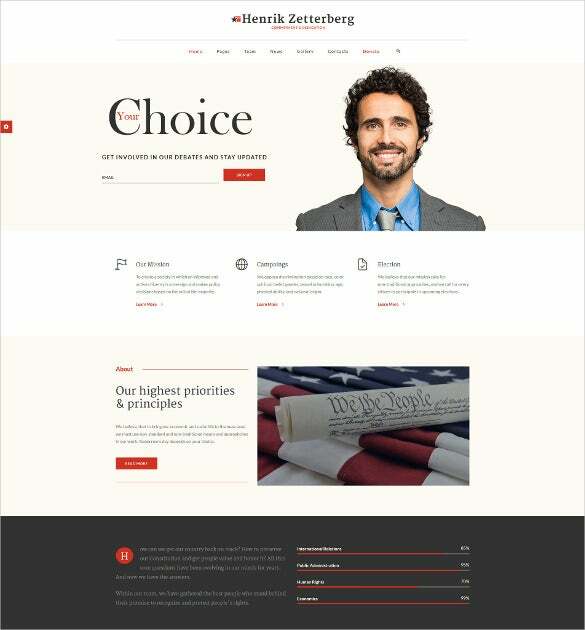 Here is Responsive Politics WordPress Theme which comes with smart HTML and CSS coding, easy admin and management tools, responsive shortcodes, design colors and fonts, sizes, various layouts, social media integration, cross browser compatibility and much more. 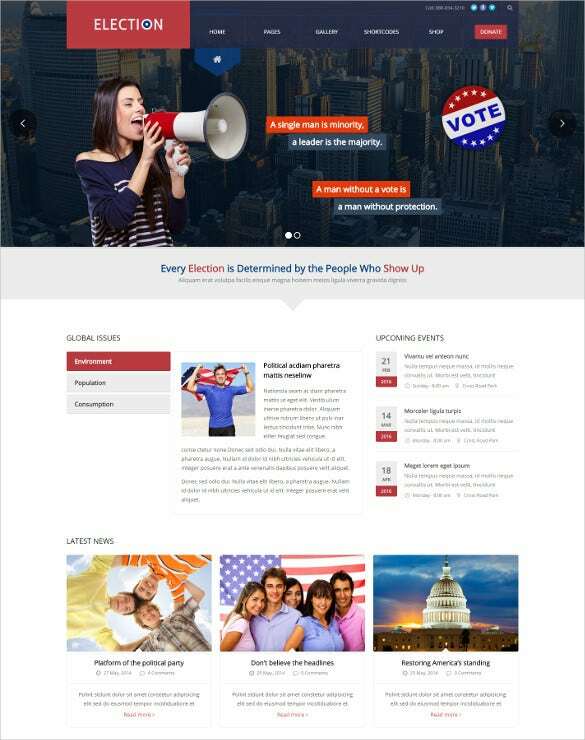 This theme is widely used for designing political websites. 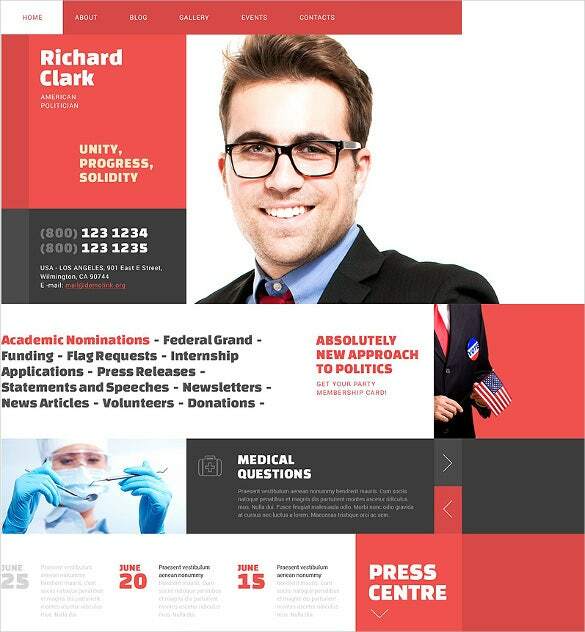 Planning to make an exclusive website for the college politics campaign? 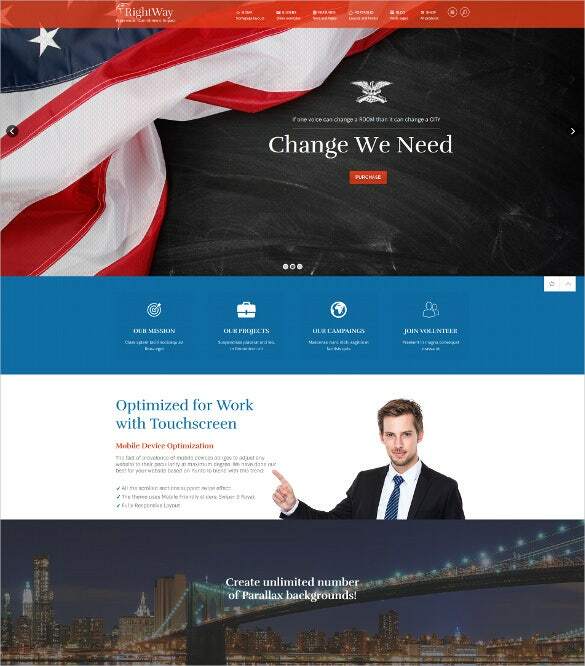 Try the Premium Political WordPress Theme offering fully responsive layout features along with HTML and CSS coding, plenty of sliders, SEO optimised content, social media sharing options, mail chip integration, bootstrap 3 framework and much more. 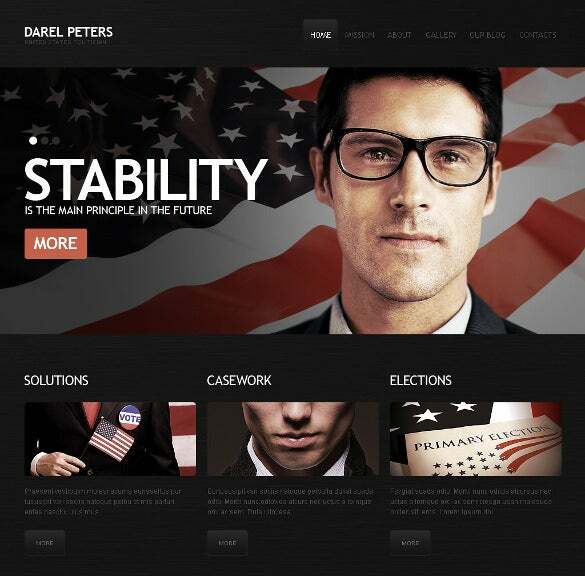 If you want to create a minimalist yet informative website for your political campaign, trust the Hot Politics WordPress Theme. Advanced features like HTML and CSS coding, Bootstrap based framework, SEO optimised content, mail chip integration, SNS buttons, plenty of short codes for customisation, related images, neat typography are some of its essential features. 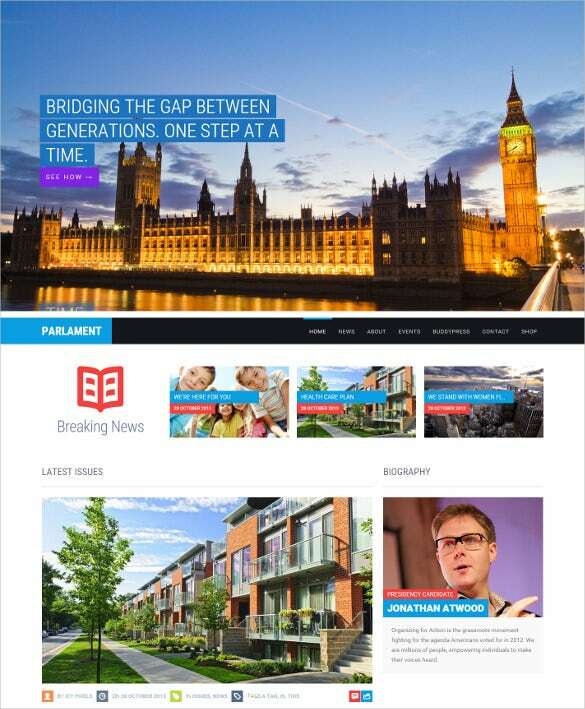 For creating an exclusively designed website for the politicians, or aspiring candidates, the Diplomat Political WordPress Template is a reliable name. 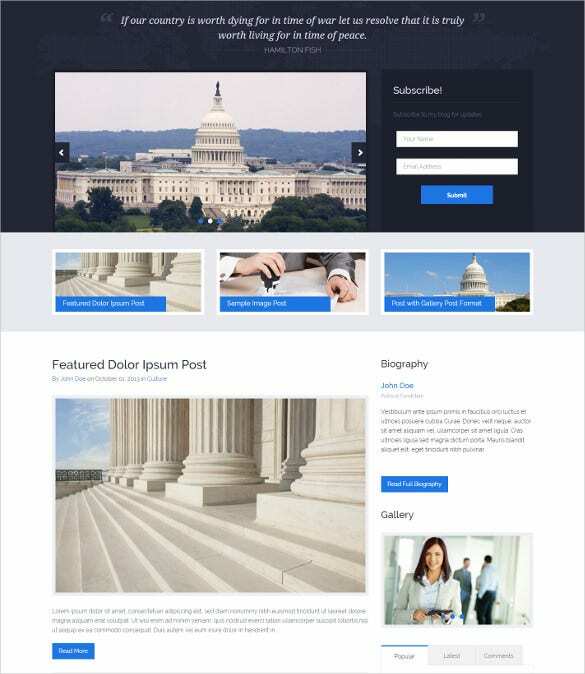 Its salient features include but not limited to optimized design with fully responsive layout, unlimited number of colour options, versatile fonts, SEO rich content, social media sharing, CSS and HTML coding etc. 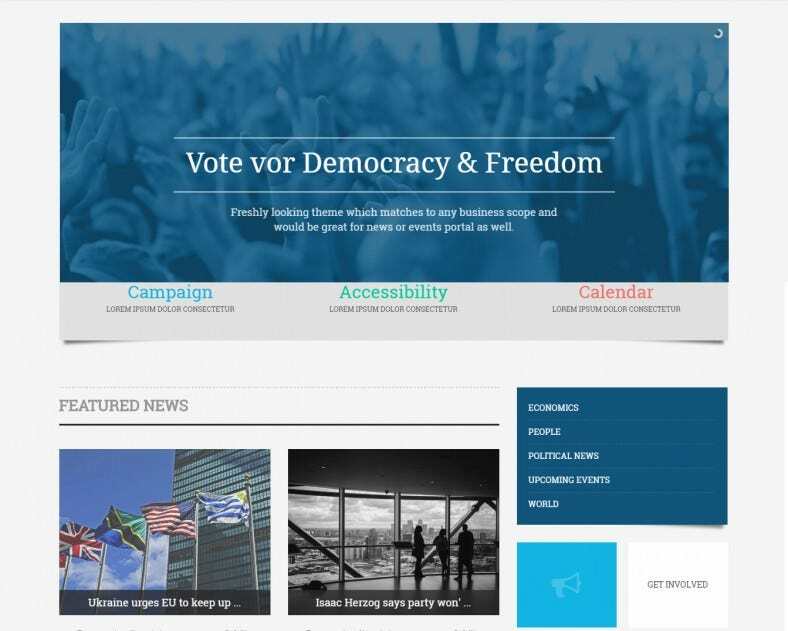 For any well-organized political campaign, the Simple Politics WordPress Template can help to build a classy website displaying the agendas and ideologies of the party. It is supported by features like HTML and CSS coding along with Bootstrap based framework, plenty of short codes and plug-in for easy customisation, multiple colour and font choice and much more. 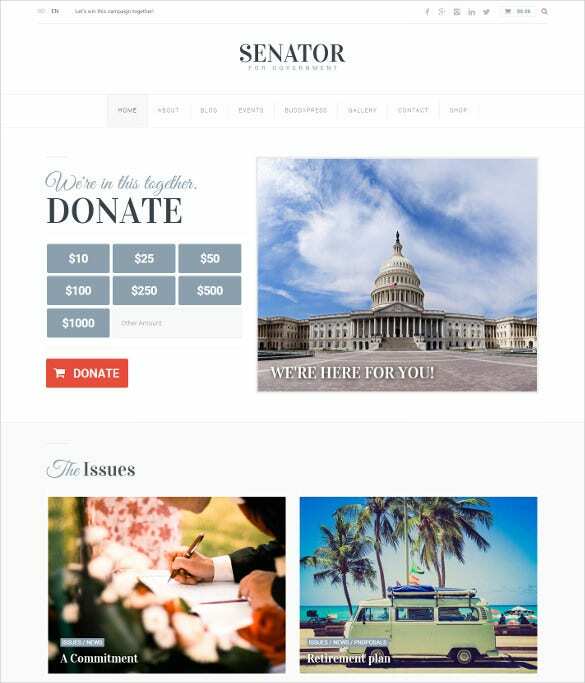 To create a premium looking website for political parties or other agencies, Senator Political WordPress Theme has been widely used by designers. Create exclusive designs with HTML and CSS coding, bootstrap based framework, SEO rich content, and social media integration system, plug-in system, cross browser compatibility and well documentation scope in both offline and online mode. 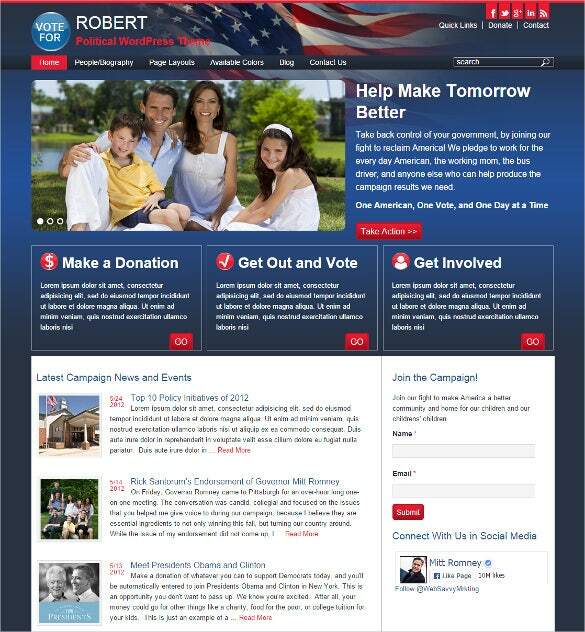 Jump-start your political campaign with Robert Political WordPress Template. It has different layouts which are totally responsive, standard bootstrap based framework, mail chip integration, revolution slider, contact form, excellent customer support and extensive scope of documentation in both offline and online mode. 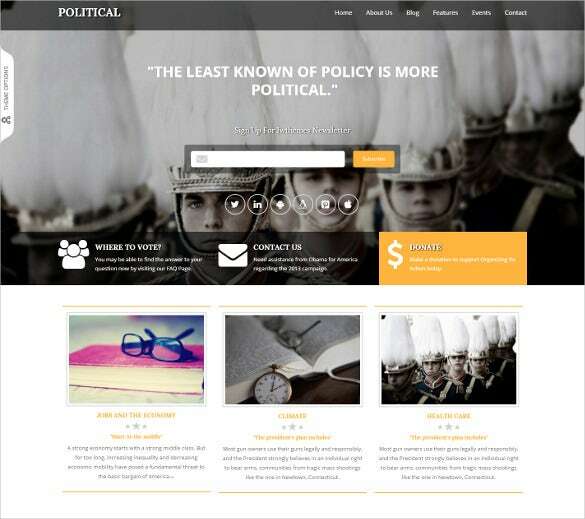 Or one might simply create a blog on politics, a simple site that discusses and observes the current political scenario.Politicians require their websites to reach the maximum number of people so that they can be heard by the majority. To this end, they need their sites to be available to people in all sorts of situations. 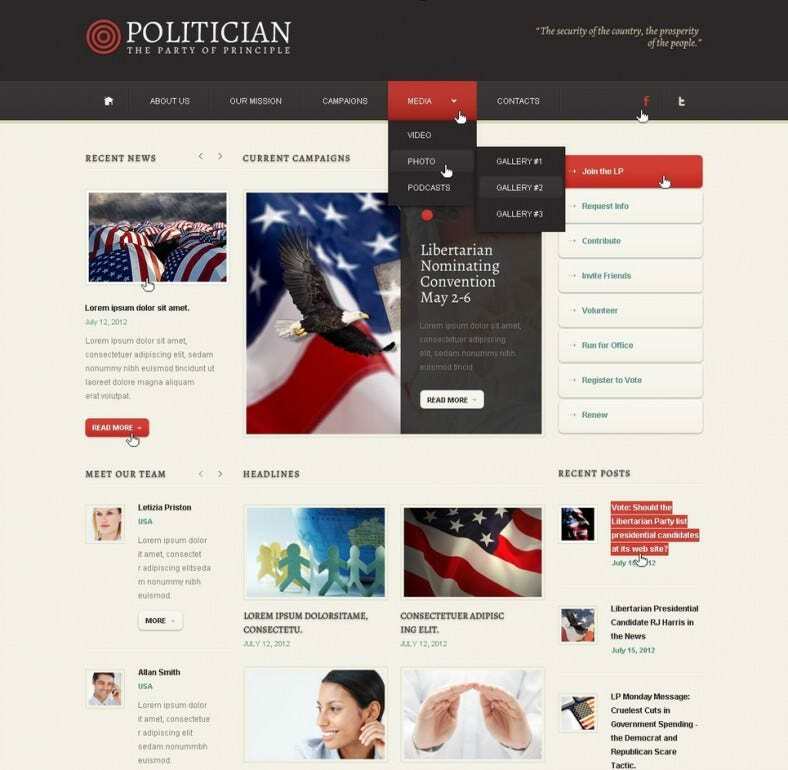 Political WordPress themes are responsive, which means they can be accessed easily by users of tablets and cell phones. The themes are also multilingual and can be translated easily, thus ensuring that those who do not understand one language may translate in into a comprehensible one. 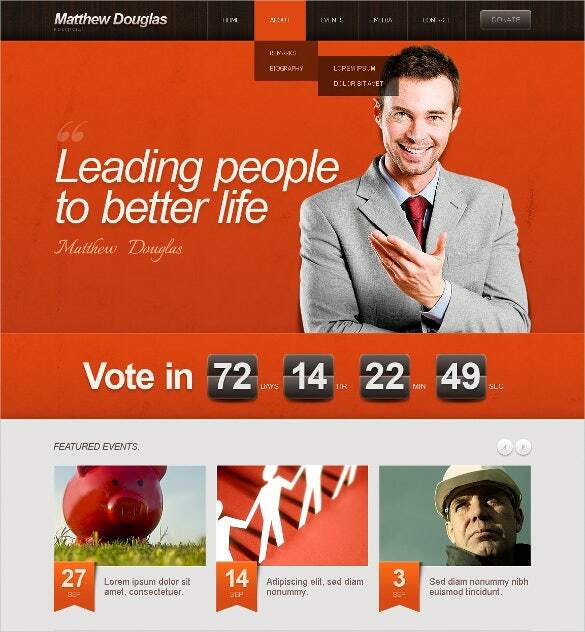 Campaign portfolios are easy to set up with amazing embedding of images in the form of slideshows or lightboxes. 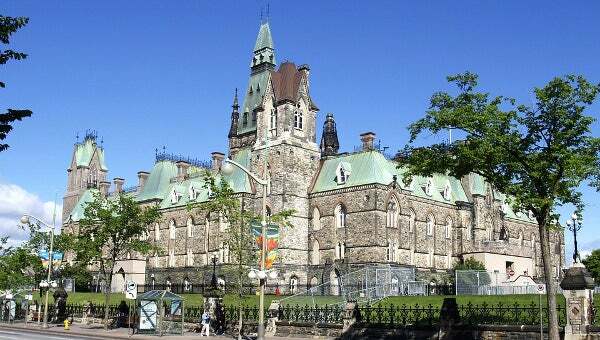 Then there are the built-in planners and calendars that can mark the major events that the politician is participating in.Integration with social media networks is readily available. Therefore, sites such as Facebook, Twitter, Google+ and many more can also be used in tandem with the websites in political activities. 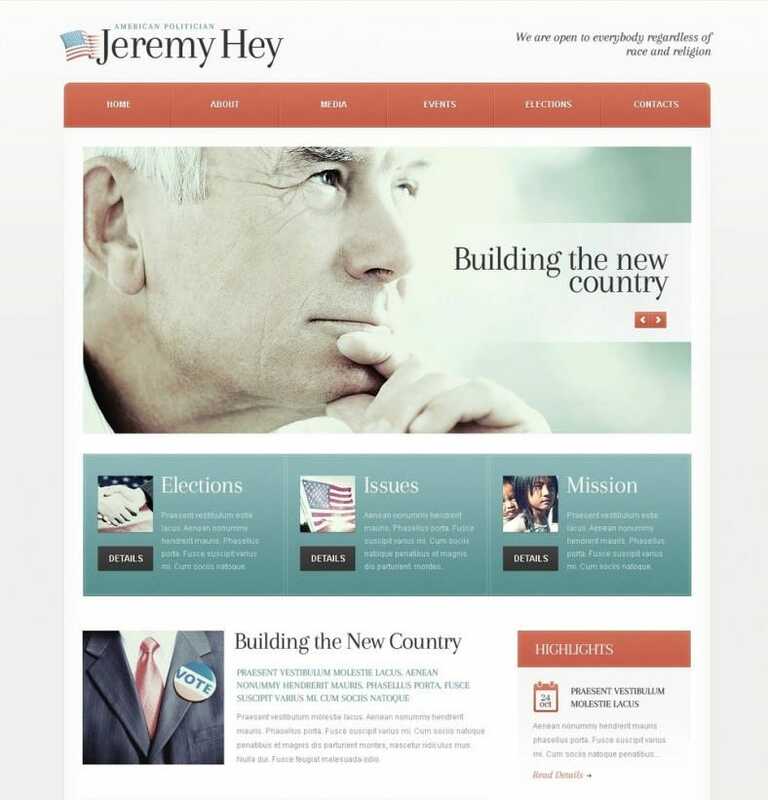 There are also design choices and layouts that may be chosen to suit the needs of the website.